I’m beginning to think I love sharing our gear with you guys as much as Mark loves sourcing it. What happens is, he thoughtfully researches every purchase (something he is really good at and I am not) then I get to use or benefit from said purchases. THEN…he undoubtedly finds the coolest stuff and I immediately think, you guys, our awesome readers, should know about this stuff! 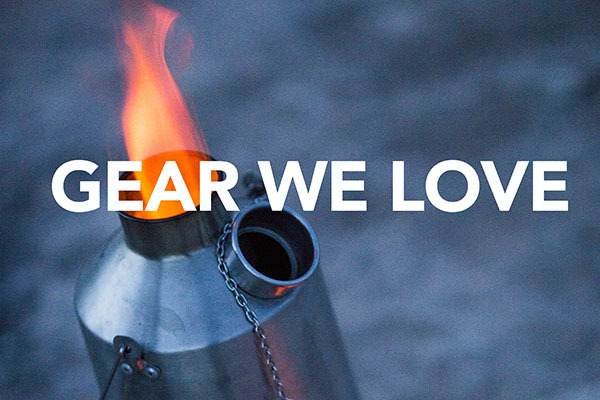 Because we want you to enjoy camping as much as we do. 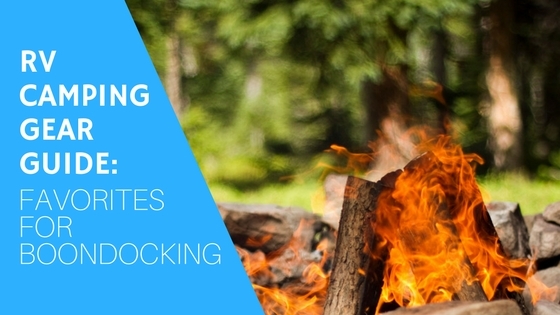 Since our last gear guide was all about getting started RVing and the essentials you’ll want right away to get you to the campground, I thought I’d build upon that with this post that’s dedicated to all our favorite boondocking gear. All the gear that makes it possible (and fun) to camp without hookups, also known as dry camping, dispersed camping and primitive camping. 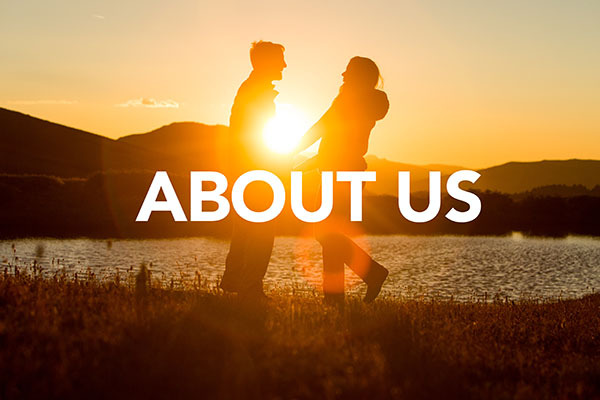 Batteries: We use 6 volt golf cart batteries which we have sourced from All American Battery in Lake Havasu City, AZ. You can find our exact batteries online here. Another good option here. We have 2 in our Casita and 2 in our Four Wheel Camper. Your battery needs may vary. Tri-metric battery monitor: Before you invest in upgraded batteries or solar power, get one of these. It will help you determine your power needs and keep track of the health of your batteries. If you want to know more about DC power, solar panels, and the battery monitor go here: https://handybobsolar.wordpress.com/ If you read enough Handy Bob you will know all you need to about managing your RV’s power needs. Solar panels: We use a variety of different solar panels as Mark has been interested in experimenting with different setups. We have panels from both Solar Blvd. and Zamp Solar. Generator: We use a Honda 2000 generator with inverter for backup power when we’re not able to generate solar power. Whether it be overcast skies or a shady campsite, it’s nice having an alternative power system. Our Casita travel trailer carries 25 gallons of fresh water. However, we still bring with us all the same water gear we used when only traveling in our Four Wheel Camper, which does not have a water tank. When boondocking, if we want to stay but are running out of water, we use our 7 gallon water jugs to replenish the fresh water tank in our trailer. 7 gallon rigid water container: We carry three of these water jugs inside the Four Wheel Camper. Trust me when I say, you don’t want to skimp on water containers. We’ve had cheap water containers leak en route and it was a big wet mess. Shaker siphon: This siphon easily transfers water from our water jug in to our trailer’s fresh water tank. Water filtration system: This simple, gravity-fed water filtration system means we can make clean water from any water source such as a lake or stream. 5′ Luminoodle LED rope light: This is our primary source of outdoor light. Combined with this portable power bank, you can have a great source of light anywhere. We’ll drape it in a tree or hang it from our awning. It’s versatile and compact. Fenix rechargeable LED headlamp: This is Mark’s go-to source of light for camping. This headlamp has 950 lumens, four brightness levels and a 18650 lithium battery that can last for over 100 hours in Eco mode. 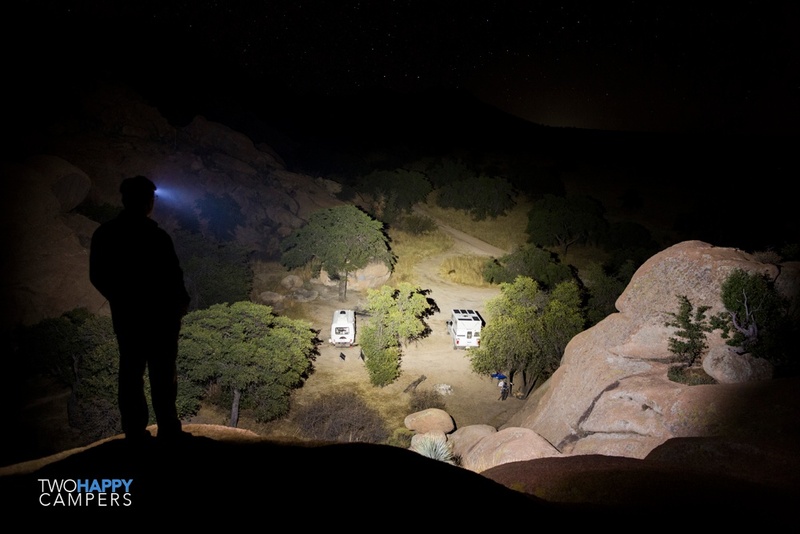 I’m blown away by the power of this headlamp as illustrated in the photo below. If you need to light up the night, this is how you do it. LED Pen Lights: (below middle) We have several of these flashlights. They’re compact and easily fit in your pant or coat pocket. One of these lives in my puffy pocket and is used daily. Fenix rechargeable LED flashlight: (below left) This is Mark’s everyday carry. It’s small enough to fit in his pocket and has a rechargeable lithium battery. Much brighter than the pen lights but not as bright as the headlamp. These items aren’t necessarily specialty pieces of gear but they are absolute must-haves for us when dry camping. When water is limited and dirt is everywhere, a few key cleaning items are priceless. 12 volt Black & Decker vacuum: I don’t know that there is a better vacuum in a more compact design. Better yet, it plugs in to a 12 volt outlet making it easy to power while dry camping. Paper towels: When water is limited I clean off a lot of stuff using paper towels, including leftover food particles from our dishes. Throw them in the fire and you’ve cut back on your fresh-water use and eliminated trash. Travel size broom & dust pan: We use this daily in an effort to keep things somewhat clean. Lysol disinfecting wipes: For those messes that need some disinfecting action. Tupperware for dish-washing: Whether you have running water or not, this is a great way to save water while dry camping. I fill the container about half way with water and a little bit of soap and do the dishes in that. The one we have conveniently sits perfectly in our sink. Our water stores are such that we plan on each getting one shower while boondocking. With that, we use alternative methods to remain somewhat civilized : ) Below are three of our favorites. In addition, a brush for taming my crazy hair and nail clippers for keeping fingernails clean are necessities. Clean face, hands and feet go a long way when a shower is not an option. Wet Ones: For washing hands. We buy these in bulk and keep containers in the cab of the truck, the truck camper and the trailer. Alba 3-in-1 clean towelettes: I absolutely love these things for keeping body odor at bay. They’re a great way to wipe down without using water. DIY camp shower: When traveling in our truck camper (without the Casita) we use our DIY camp shower. This is just your ordinary bug/deck sprayer (available at any Home Depot or Lowe’s) replace the nozzle with a kitchen sprayer and you’ve got yourself a shower. Fill it with water in the morning, set it in the sun and you’ll be surprised how warm that water will get sitting in that black container all day. 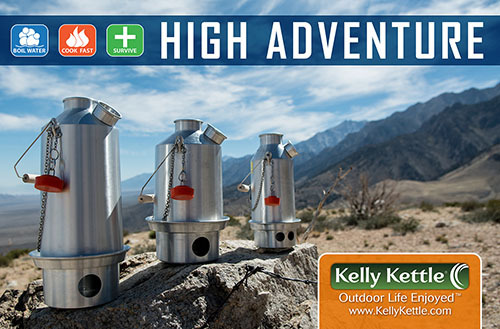 Bonus: Mark will add some boiling water from the Kelly Kettle and now we have a hot shower. Pahque outhouse tent: This tent provides us privacy and blocks the elements for showering at camp. The PahaQue tent is a well thought out design with places to hang your towel outside the tent, several pockets inside to store your toiletries and a net overhead to hang your solar shower or put your clothes. 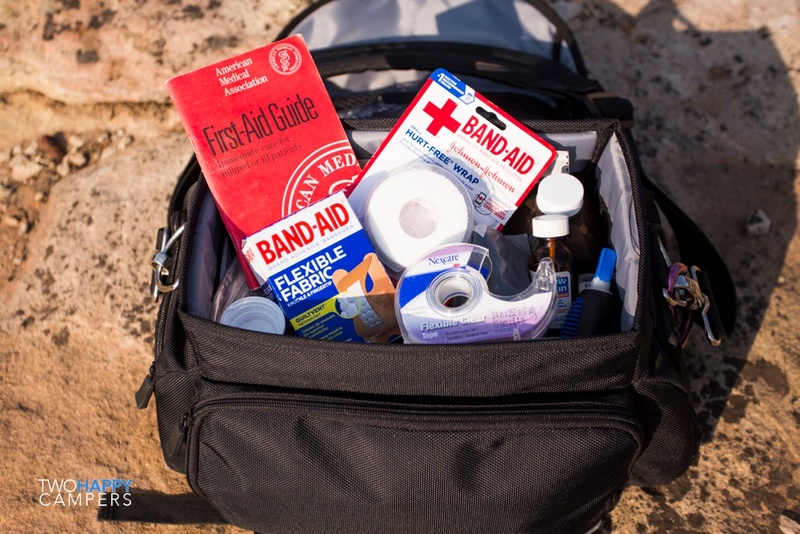 First-aid kit: We carry a plethora of first-aid items that have been acquired over time. I’ll go in to detail about all those items in another post, but for now, please be sure you have some sort of first-aid kit on hand when camping. There are a lot of ways to get hurt and boondocking often means being far from help. The first-aid kit I’ve linked to looks awesome because it contains a smaller, travel-size kit within it, which is great to keep in your pack for hiking or other activities away from camp. ACR Personal Locator Beacon (PLB): Our PLB is simple and straightforward, with the push of a button the nearest search and rescue will be notified and sent to our location. Having this gives us peace of mind when venturing in to the back country. Delorme InReach Satellite Tracker: With this tracker we’re able to send text messages without cell signal. If traveling to remote areas, we can use this to send our coordinates to family members so that someone knows where we are. This also gives us a tracking option if we want someone to be able to track us. Useful for a long, remote hike for example. The reason we carry both of the above is that the PLB should only be used in extreme situations. If we needed help and we needed it now, the PLB would be the fastest way to get it. With the tracker, if we were to run in to trouble or suffer a minor injury, we would have a way to establish communication with someone and arrange for help without calling in the brigades the way the PLB does. We don’t have any specialty items in this department but wanted to include these items in our list to make sure it was complete! How you dispose of waste depends on where you’re camped and what sort of services your rig offers. When camping in just our Four Wheel Camper we use a shovel in areas that it’s appropriate and private enough to dig a hole. Otherwise, we use our cassette toilet. With our travel trailer, we have a bathroom and a black tank that we can fill. Mini shovel: This small shovel has a wide variety of uses, including digging holes for waste disposal. Use Leave No Trace Principles to properly dispose of waste in nature. Cassette toilet: This toilet has been an awesome amenity to have in our truck camper. Another creature comfort that makes our truck camper just like home. Happy Campers toilet chemical: We use this toilet chemical for both our cassette toilet and travel trailer toilet. Portable tabletop grill: This grill was a gift from some friends who’d heard us complain about our cheap camp grill. 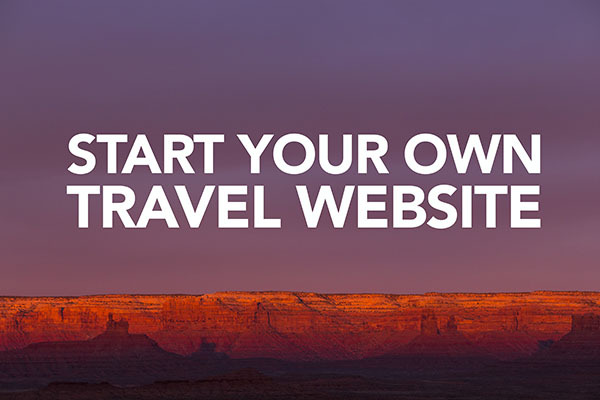 This one works great but we do wish for something a little smaller now that space is at a premium with full-time travel. I will say, if we were in the market for a new grill, I’d be looking at this Weber one. I feel like we see these at people’s campsites all the time. Collapsible single cup coffee drip: There’s no room for a coffee maker in our less than 200 sq ft. This is by far the simplest way to make coffee at camp. It’s compact and easy to clean. Cast iron cookware: Photographed below are two of our three go-to cast iron pieces. 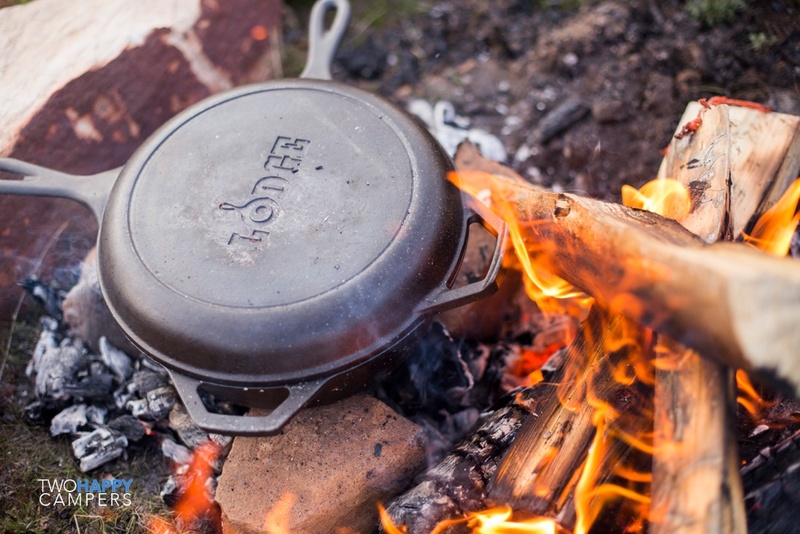 With cast iron, it’s easy to make a durable non-stick coating with proper seasoning. They work great over a fire as well as a stove or grill. The two pieces below fit together to make a nice dutch oven. Harmony House Foods: You can only carry so much fresh food with you on a camping trip before it goes bad. 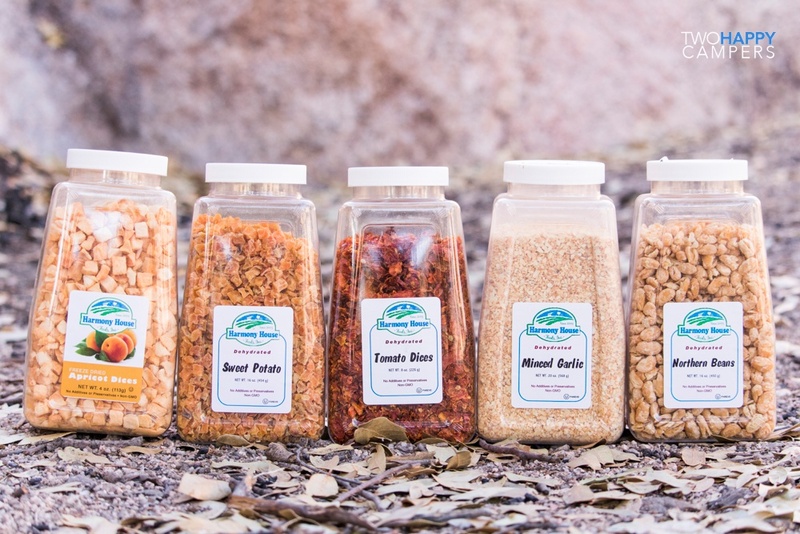 Dehydrated and freeze-dried fruits and vegetables are an awesome alternative. Harmony House Foods was an awesome find for sourcing this kind of food and we have a ton of it. We use these to makes soups, pasta dishes, quesadillas, etc. Having certain staples on hand like dehydrated garlic and onion are incredibly versatile. We use these in a number of different dishes. The freeze-dried fruits are a delicious topping for oatmeal and cereal. Verizon hotspot: We’ve had excellent results with this hotspot. The most technologically advanced LTE hotspot on Verizon. 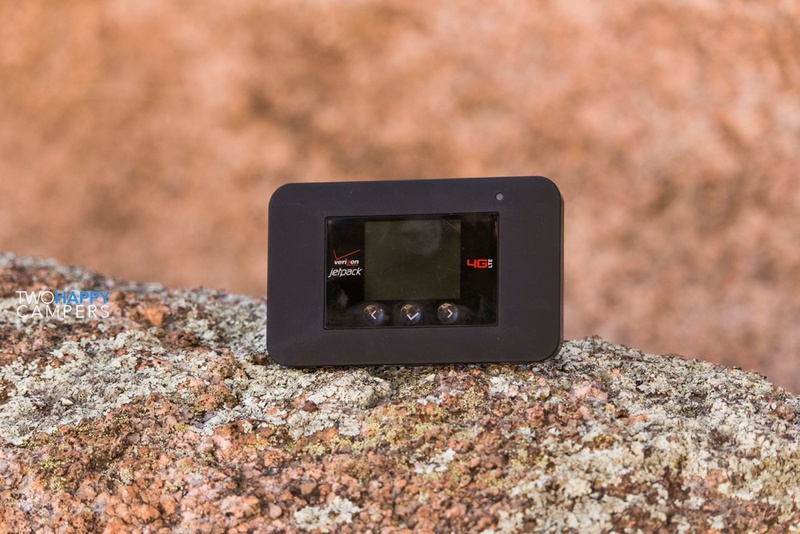 Comes with two antenna ports which is important for trying to get the best signal in remote locations. Yagi antenna & painters pole: The Yagi directional antenna lets you point in the direction of a cell tower to acquire a better signal from long distances. Mark attaches the antenna to a painters pole and secures it to the side of the truck with bungee cords. We’ve been able to pick up usable signal from almost nothing with this antenna. 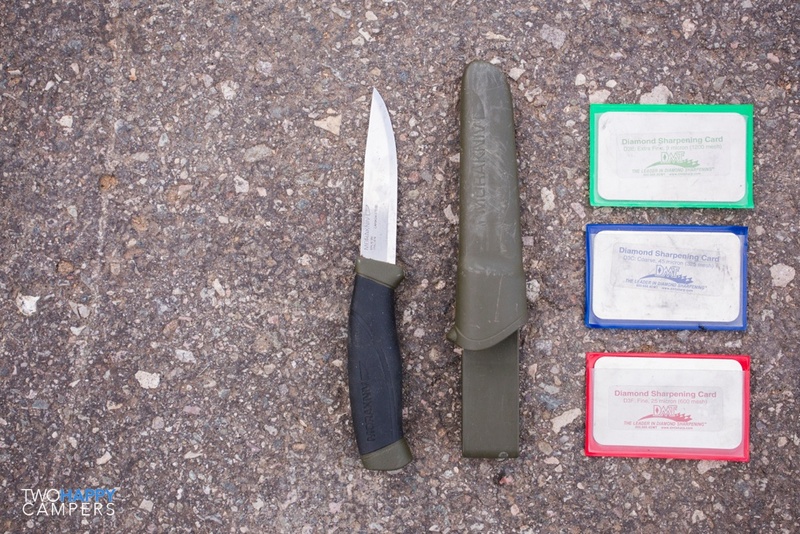 Morakniv: Having a sharp knife on hand has a wide variety of uses while camping. These inexpensive knives take and hold a really sharp edge. Fiskers splitting axe: This is Mark’s go-to axe that he uses to reduce the size of commercially-purchased wood. Silky hand saw: Easy to use pull saw that makes collecting wood (where allowed) easier. It’s also been used on a few occasions to clear downed trees from forest service roads. I have no doubt I’ll come up with 10 more items after publishing this post. However, these are the stand out must-have items that we love to have when dispersed camping in remote areas without amenities of any kind. Your needs and wants will probably differ as everyone’s setup and desires require different things. We do hope some of our favorites listed here will help you get out and enjoy all the best that boondocking has to offer! 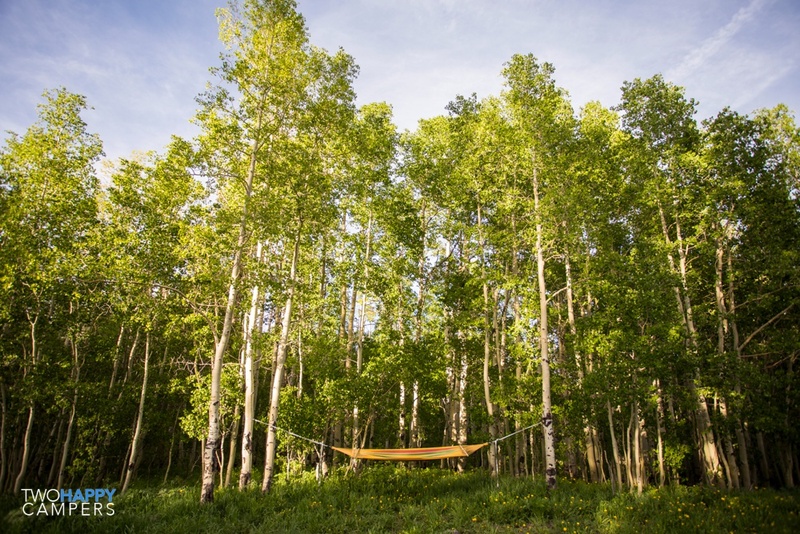 And don’t forget, camping is as simple or complex, as plush or bare bones as you want it to be. Whether you have a tent and sleeping bag or Class A outfitted to the hilt, there are a million different ways to enjoy the great outdoors for everyone and every budget! Wondering what the heck boondocking is and why you would want any of this gear? I’d probably give you my Weber Q grill if you were close by. It works fine for about the first season (well, sometimes it does, and sometimes it doesn’t) and the food cooked on it tastes wonderful, but far too soon the regulator goes south, the igniter doesn’t ignite, burner tubes clog from grease dripping directly on them, and rust out, but the worst is that the porcelain comes off the grate pretty quick and it rusts, which is dangerous for your food, and before too long, you’re spending almost as much to replace parts as you did to buy it… which of course, is the modern manufacturing and merchandising business model. By the way, you can’t buy any of these parts on the rack of “parts and accessories” Weber offers in hardware or big box DIY stores, you have to order from Amazon or the like. (Considering you hang out in the desert more than I, your rust issues may take longer, although it’s not like I let it it sit in the rain… but I live in MO and summer is humid. Despite buying 3 different 6′ hoses to adapt the grill to larger 10# or 20# propane tanks, this little devil so often refused to function off larger tanks that we started buying 1# camp bottles at Walmart along the way to feed it. Even replacing the regulator didn’t make any difference; I believe it has to do with the safety mechs built into the larger tanks. So great… the grill is not only taking up a ton of odd-shaped space, but we also had to make room for gas bottles when we have one sitting right there in the 4WC propane closet. It’s big for the cooking area it offers. The curved lid means taller items can only sit in the middle. The heat is uneven, but cooking for two, that’s not too terrible. The handles and legs are integral and make it take up more space than it looks like. It doesn’t like to work in a gusty or elevated wind condition; the wind goes up the grease drain hole in the bottom and lowers the temp so bad you burn your propane while your meat only simmers. I’ve even had it blow out the flame in a pay-to-stay campground outside Montrose, CO. Felt like quite the village idiot moving my little grill over next to my truck tire and trying to box it off with things just to be able to cook dinner in front of the big rigs. We tried a smaller cheaper ($99) box grill from Home Depot that stowed much more nicely, but it’s straight tube burner didn’t put out enough heat, so it sits on a shelf in the garage. Anymore, we just carry a high-output two-burner camp stove from Bass Pro, carry 1# bottles for it, and grill our meat on Lodge griddles wrapped in Aluminum foil (easy cleanup). I cooked in steakhouses decades ago, and you can have amazingly tasty meat seared and griddled… you don’t really want all those juices leaving the meat and dripping into a grill anyway. Just my two-cents. I know you see a ton of these out in the campgrounds, both by rat-rigs and luxo-buses, but if space is still a premium, I’d keep looking. We finally found that we aren’t trying to barbecue our food so much as just get a tasty meal done, and there were easier ways to do that. Your mileage may vary. Well Ron, I feel like I couldn’t have gotten a better straight-forward review of the Weber grill had I gone around and asked all those people that have them. It sounds like it’s not any different than our other camp grills that have given us the same kind of grief. We like how our current one works but it just doesn’t seem worth the space that it takes up. I think you might have the right idea with just foregoing the grill altogether. Thanks so much for your input! “Discos” (cooking griddles) are rather popular with folks who like them. Bayou Classic makes one you can get for around $70 a lot of places, but for a lot of entertainment value, the folks at MoJoe Cookers have the best website going, even if their steel griddle disc costs $200. Be warned, watching their videos can be addictive and bad for your waistline. 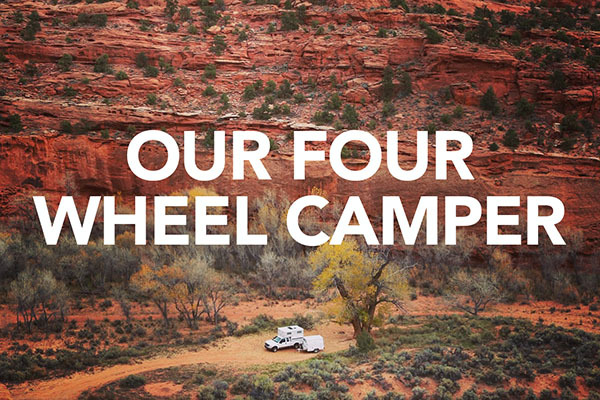 They have videos demonstrations of their product in the backcountry of Grand Staircase-Escalante, Death Valley, etc., …over a campfire, a gas stove, or on a kettle grill. The food shots will make you hungry. Mark could probably build one of these himself, instructions abound on the web. I’m intrigued. Sounds like I might be watching a few videos today! You could use the satellite tracker more often. LOL Iowa dad! Great info! What solar panels are those pictured on the right up above? Did you take the old solid panels off the FWC and go with flexible w/ eternabond? Was there a post on this or do you plan one on you rational, process? Keep it up! Thanks! Yes, Mark took the factory-installed panel off the roof of the FWC and now uses it as a moveable panel for the Casita. The flexible panels were affixed with eternabond. As for another article, Mark isn’t much for writing, and I know very little about solar, but maybe one day I’ll get him to start! Great write-up! For personal lighting I use Photon lights I have them clipped all over, on keys zipper pulls, pockets. What type of recovery gear and flat tire repair do you use? Thanks Bob! I’m not sure off the top of my head what Mark carries for recovery gear. I’ll have to ask him. What I can tell you though is, in the six years we’ve had our FWC, we’ve never used any recovery gear for ourselves but have used it countless times to help others. We’re always happy to have what we have so we can help!